In the traditional method, when you click the submit, your browser will load process.php and it will jump from form.php to process.php. With the jQuery/AJAX way, process.php becomes a background process which the web server will call on, and when you click on the "Submit" button, form.php pushes the data to process.php, but your browser will remain showing form.php. Once the process.php has done what it needs to, it will return to form.php some output to be displayed. 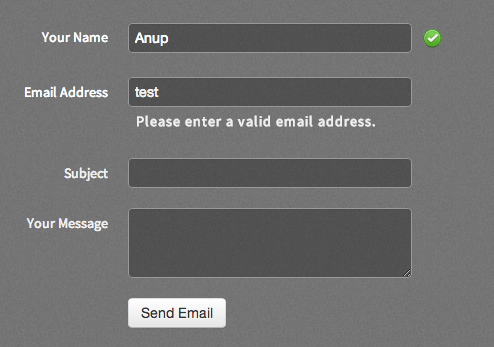 I call the jQuery validate method (make sure you have included the jquery validate plugin - download the script from jqueryvalidation.org) on my form #contact-form, and proceed to define what to validate. Lastly, the submitHandler is what gets processed if the validation is successful. In this case, I'm doing an ajax post method, sending my form data to process.php, and get back any results as HTML data which will be displayed into #results. Over at process.php, I'm simply printing out the data received to show you the information was sent and returned. if you copy and paste the above source codes with correct file names, it will work automatically. I copied your code and the form worked perfectly fine..
i want to use it in my wordpress. is there anyway to use this form in wordpress without using plugin? It is very much possible. I have done it long time ago. I don't have source left. But what i did was place the codes (html, jquery) in the right place. Do exactly same as you do in PHP and it will work. You don't need to do any thing special. well, the only thing i didnt understand is...when i press submit button...the form wont send...and process.php is not in active state..